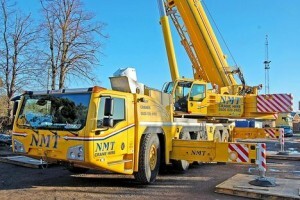 UK crane rental company NMT has taken delivery of the very first 220 tonne Terex Explorer 5800 All Terrain crane. Launched at Bauma last year, the five axle Explorer 5800 features a 70 metre, five section main boom with a bi-fold swingaway and a 12 metre straight insert, offering a maximum height of 103 metres. Powered by a single Euromot IV/ Tier 4F Scania diesel engine, the crane can operate with axle loads from 9.1 to 16.5 tonnes. It also has a short 1.2 metre front overhang. The 13.2 metre long, three metre wide carrier has 10x8x10 all-wheel steering system. Additional features include stop/start technology, Terex’s latest IC-1 touch screen control system and radio remote controls. The operator’s cab tilts up to 20 degrees to help improve visibility up the boom.